I thought I was going to be the first female Christian record producer, since I wasn't aware of any. But lo and behold I look on CeCe Winan's Everlasting Love album where every other track is produced by some one else and there she is. Lauryn Hill produces a track or two. 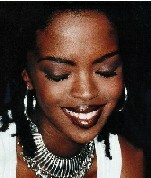 And of course she produced the gist of her Grammy-winning Miseducation of Lauryn Hill. She's one of the only urban artists I listen to.